The American Business Journal (ABJ) is the third major digital publication website launched by George Media Inc., and is sent electronically to 127,000 individual senior executives across the United States. The ABJ is essential reading for America’s top business leaders who want to stay informed of current business news, industry topics and trends. The magazine offers readers a glimpse into major U.S. industries including construction, energy, food and drink, healthcare, manufacturing and more, through comprehensive profiles of successful US enterprises. 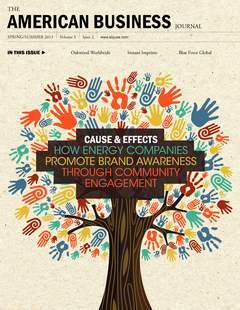 The magazine also has feature articles and columns from writers focused on all aspects of the U.S. business landscape, from environmental to legal to safety issues. Through ABJ, readers are able to access illuminating interviews with key public figures and regulatory bodies. The ABJ website serves as a useful tool for hosting the ABJ and is in line with all George Media publication websites, audited through the BPA Interactive Membership. George Media took this pioneering step with BPA in order to ensure that valued advertisers know the exact number of eyes viewing the magazine/s in which their ad is placed. In addition to showcasing the ABJ, the website serves as a useful tool for visiting executives to keep abreast of relevant business news at home and abroad. The ABJ website offers daily U.S. and world news to website viewers, and makes perusing the online magazine easy and bug-free. The site also promotes interactivity through the ABJ blog, updated weekly. In the special “Business in Action” section, companies chosen to be profiled in the ABJ have the opportunity to invite their preferred suppliers and service providers to share in the ‘audited’ exposure and reach of both ABJ and its website through a number of customized advertising packages.